Our spinal column performs various critical functions within the human body. It is responsible for providing us with a full range of motion for our upper body as well as protecting part of our central nervous system called the spinal cord. Most people are too quick to resign to invasive surgery procedures when it comes to body ailments. With something that performs a function as important as the spine, surgery can be complicated and risky and the recovery time can be long and painful. Non surgical spinal decompression is an option for those suffering from various different spinal conditions including sciatica, disc herniation, spinal stenosis, disc bulge and degenerative spondylolithesis. But what exactly is Non surgical spinal decompression? Non surgical spinal decompression is an alternative method to alleviate the compression on the nerves in the spinal column caused by a bulging disc, slipped disc and many other spinal column problems. The procedure involves relieving the pressure put on the nerves in the spinal column due to these disc problems. The most common symptom of the problems that may be relieved by non surgical spinal decompression is pain in the legs and weakness of the knees. The effectiveness of the therapy when asked to recipients is around 70%, however no clinical evidence exists to prove that non surgical spinal decompression is effective. The process is similar to the tales of old torture devices used to stretch out the body. 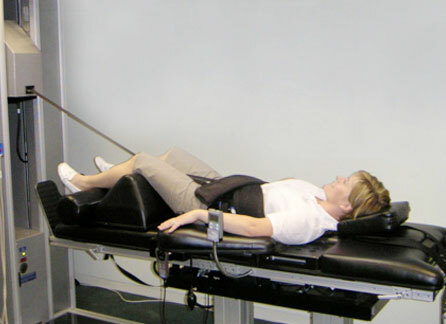 The patient is strapped to a mechanical traction device, usually in the form of a table which is controlled by a computer. It lasts about 30 minutes, made up of fifteen, one minute motions where the computer controls the mechanical traction device to alleviate pressure on the nerves in the spinal column. In the process a vacuum is created in the vertebral disc, allowing the nucleus (the centre of the vertebral disc) to heal and the annulus (the hard shell of the vertebral disc) to harden and reform. The non surgical spinal decompression method is largely theoretical, and there are many medical professionals that do not agree that it will aid in the relief of pressure and pain associated with spinal column injuries or conditions. The NHS does not offer non surgical spinal decompression as part of their list of procedures covered for the relief and repair of the numerous spinal column and vertebral disc problems. Because of this, you will be required to pay for the therapy yourself. It is not all that expensive when compared to the surgical equivalent, costing anywhere from £100 to £250 per 30 minute session. It is recommended that you have the therapy done on a regular basis to maintain its results. Non surgical spinal decompression is a great way to start relieving some of the pain associated with spinal column problems, and removes almost all of the possible complications from surgery like infection and as there is no recovery time, you can get right back to living your life.